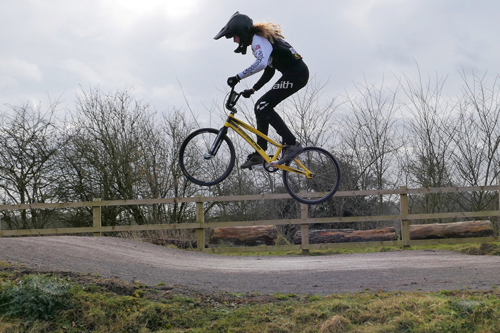 A STUDENT from Hanham Woods Academy has just been crowned European BMX champion. Betsy Bax, who is in Year 7, fought off fierce competition in Belgium from an international field of over 50 female under-12 riders to claim the prize. The 12-year-old is in the England team and was world champion in 2015. She has been British and national champion four times and is currently the UK’s number one for her age group. Betsy rides for and is sponsored by the Stay Strong team, an international BMX brand, and is in their worldwide squad. Inspired to ride by her older brother who also competes, Betsy started riding at the tender age of four. She now trains on her bike twice a week for three hours per session and also works out in the gym to build strength and endurance three times a week. Future competitions include regional, national and international races. Betsy said: "My achievements make me happy and proud. I would like to thank my sponsors Stay Strong for their continued ongoing support and also my family for driving me around the country to races, without them I could not do this!" Steve Kneller, principal of Hanham Woods Academy, said: "We are extremely proud of Betsy and her accomplishments to date and we wish her future success in the years to come from all at Hanham Woods."